As marketers, we’re always looking to increase our productivity. We practically live by the phrase, “work smarter, not harder.” It’s easier said than done, though – especially if you don’t have the tools you need to get the job done more efficiently. Trello is a collaboration tool that organizes your projects into boards. At a glance, you can see what you’re working on and where tasks are in the project workflow – making it a great project management tool for marketing teams. Oddly enough, we previously evaluated Trello for our project management software but ended up choosing Teamwork instead. At the time, we felt that Trello was too simplistic and loved that Teamwork had all the bells and whistles (such as time tracking and integrations). Ultimately, it was all these extra features that got in the way of what we needed our project management tool to do: Quickly and easily track projects in our pipeline. You can use Trello in other ways as well. I’ve used Trello to organize blog topic ideas, map out campaigns and manage upcoming projects. The possibilities are endless with Trello, which is why I always recommend it to someone who is looking for a new project management tool. Every day, I’m pulled in a ton of different directions, and it’s easy for me to lose my focus and momentum when I’m working on a task. That’s why I love the Pomodoro Technique. The Pomodoro Technique is a time management method that helps you focus on tasks and power through distractions. You work in short sprints, ensuring you’re constantly productive. It also allows you to take short breaks that keep you creative and bolster your motivation. It works like this: choose a task, set the timer to 25 minutes, work on the task until the timer rings, put a check mark next to the task and take a short break (approximately 5 minutes). After every four Pomodoros, you take a longer break of 15 to 30 minutes. 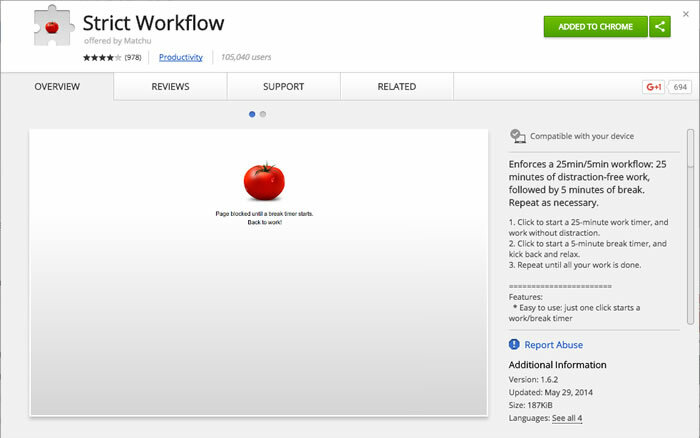 There are a variety of Pomodoro timers out there, but my personal favorite is Strict Workflow. It integrates into Chrome, and while I’m working, I can’t access sites like Facebook and Twitter. Grammarly is an online spelling and grammar checker that helps improve your communication by finding and correcting common writing mistakes. It’s great for grammar nerds who want a second set of eyes on their work, but it’s also perfect for people who know that grammar is one of their weaknesses. Grammarly isn’t a perfect proofreading solution, since it does occasionally miss errors or recommend changes that don’t make sense within the context of your writing. However, you can usually catch these minor mistakes by re-reading your writing. Even with its shortcomings, Grammarly is still my favorite proofreading tool out there. Over the years, it’s caught countless mistakes I may not have noticed otherwise, and it’s saved me time as I proofread my work. There a ton of tools out there that allow you to store and share documents, but Google Drive is by far my favorite because of how simple it is to use. Within Google Docs, you can easily edit documents, see the revision history and collaborate with team members. Not a fan of Google Drive? Try Dropbox or Box instead. Both are great tools and offer a lot of flexibility for marketing teams. As marketers, we spend our days working on a variety of tasks, whether it’s writing content, posting to social media, updating website pages, conducting keyword research or running analytics reports. Often, this means logging into one tool for social media management, another to write blogs and another to pull analytics reports. All of this jumping around can be stressful for your team and decrease productivity. HubSpot eliminates the need for multiple platforms and brings all your marketing efforts to one centralized location. Plus, HubSpot integrates with other platforms – such as Join.Me, GoToWebinar, Teamwork and Hotjar – allowing you to continue using the tools you already love. Okay, so this isn’t really a tool. But hear me out. Have you ever noticed how you’re more productive at the beginning of the day? According to a study from Harvard, a 20- to 30-minute nap boosts performance just like it’s the start of the day. Keep it short, though, as longer naps can lead to sleep inertia – the post-sleep grogginess that can be difficult to shake off. Every business is different, and there are a variety of tools that can help you increase your team’s productivity. The key is finding which tools and apps work well for your marketing department. Looking for even more ways to increase your marketing’s team’s productivity? Download our free marketing report template to streamline your monthly reporting process. I’m passionate about helping my clients achieve their goals – whether that involves helping them show up in search engines, generate more of the right leads or nurture existing customers into brand evangelists. Are High Bounce Rates Always Bad? Do LinkedIn Ads Really Generate B2B Leads? Read This Case Study. Clariant Creative is a full-service inbound marketing agency based in the western suburbs of Chicago, IL. We help businesses create clarity in their marketing, so they can help their clients move forward with confidence. Copyright 2019 Clariant Creative Agency, LLC. All Rights Reserved.